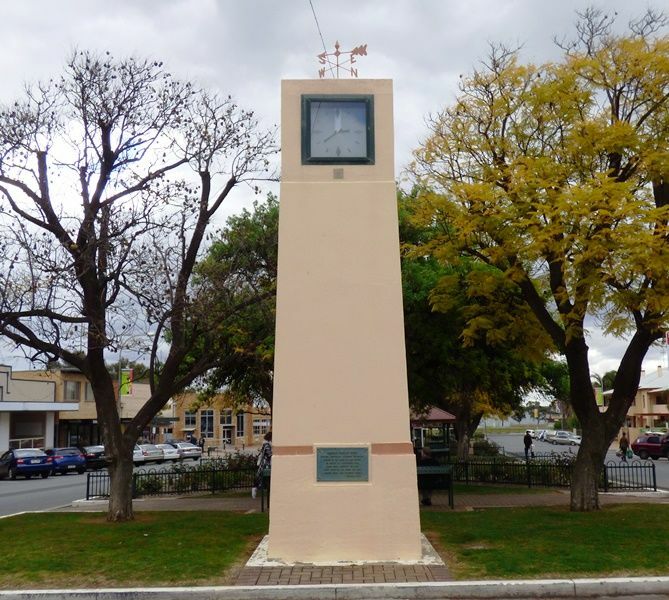 The clocktower was built in 1944 to commemorate the Charles Sturt Expedition which camped near Lake Bonney in 1844, during his search for the inland sea. The memorial was erected as part of the Sturt Centenary celebrations. His party, which included John McDouall Stuart, left Adelaide in August 1844, with a boat, and returned in January 1846. It had been a very difficult journey with temperatures often above the 45 degrees Celsius. When he finally reached the Stony Desert and the Simpson Desert he was convinced that there was no inland sea. The tablet on the new Sturt Memorial at Barmera was unveiled by Mr. Wm. Magillivray, MP, on Monday afternoon. The memorial is constructed of Spring Cart Gully freestone, and eventually will have a clock erected at its top. It is situated in the reserve in Barwell Avenue, near the bus stop. Cr. 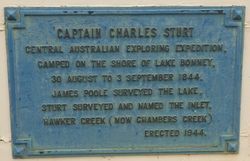 D. H. Brooke (chairman of the Barmera District Council) presided at the ceremony, and Mr. C. M. Hambidge (president of the Royal Geographical Society) gave an outline of Sturt's expedition. Murray Pioneer (Renmark, SA), 21 September 1944.